"In 'shop' the artist has arranged the elements of his profession: the portrait subject ... the lay figure (first aid to the mastery of drapery); and, lastly, the painter himself ..."
Painted in Lambert's London studio, 'The shop' is an eloquent comment on the artificiality of studio portraiture. 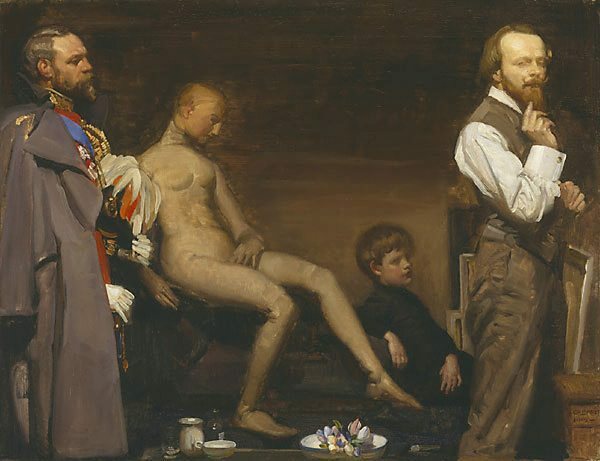 Lambert presents a formal arrangement of figures in which a model dressed as King Edward VII (of whom he painted a portrait at around this time) and a dummy model made from fabric, are counterpointed by a self-portrait of the artist himself at extreme right, acknowledging the viewer. The title, an abbreviation of artist's 'workshop' also alludes to the inevitable fabrication necessary to any trade. Signed and dated l.r. corner, black oil "G.W. LAMBERT/ 1909-". Art and Artifice: George Lambert (1873-1930) , 1996, 50. Jimmy MacDonald, The art and life of George W. Lambert , Melbourne, 1920, 9. Anne McLaughlin, People and destiny: George Lambert and Federation , 'People and destiny: George Lambert and Federation', pg. 10-33, Dubbo, 2001, front cover (colour illus. ), 14, 23, 38. G.F.H. Schuler (Editor), Age , Melbourne, 21 Jul 1923, 15. The Weekend Australian , 'Painter mastered the past', pg. 21, Sydney, 20 Apr 2002-21 Apr 2002, 21 (illus.). Review of exhibition 'People and Destiny: George Lambert and Federation'. Editor Unknown (Editor), The Herald , Melbourne, 18 Jul 1923, 6. Unknown (Editor), Sun , Sydney, 21 Jul 1923, 2.